A walk around town is a walk back in time. 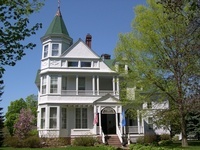 Enjoy the many beautifully restored Victorian era homes in the historic residential district of Hudson, one of which is open to the public as a bed and breakfast inn. Take a walk and see it for yourself.